We do not currently ship product outside of the U.S.
Orders are shipped out MONDAY - THURSDAY. If your order is placed before 9:30 AM, we will try to process it that day. If it is placed after 9:30 AM, it will be processed the following day. If you select the Ground option, you will receive the order in 1-8 business days. Keep in mind, if you are purchasing frozen goods, the dry ice will only last for 3-4 days. Though most orders will not require more than 3-4 days of transit, you can choose the 1-day or 2-day express options if you feel it is necessary - with that in mind, we often find that the FedEx Ground service works fine for most orders. It is also quite a bit cheaper, which is always nice. Only "Express" orders will be delivered on Saturdays. No orders are delivered on Sunday. An $18.00 handling fee is applied to all orders that include perishable items, covering the cost of dry ice, a styrofoam cooler(s), and shipping supplies. Shipping rates are an addition to the handling fee. All perishable goods are packed with 15 lbs of dry ice to ensure products stay frozen. We are not responsible for any FedEx delays, but will work with all parties to ensure any issues get resolved. Bourque's Specialties is not responsible for any delays caused by FedEx or any adverse weather conditions. If you are having trouble placing an order, or see an error message saying "no shipping option for address you entered", please be sure you have entered the correct address and click "REFRESH RATES". If this still does not work, call the shipping department at 337-585-6261 for assistance. Thanks for the business! 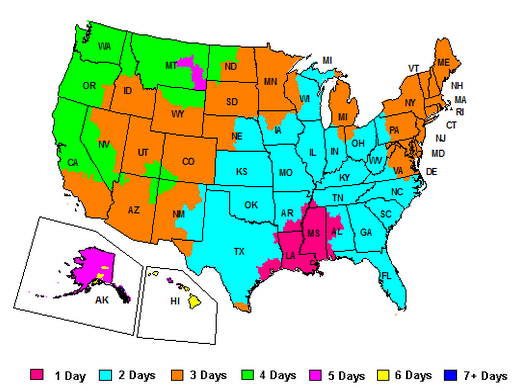 The map below indicates FedEx Ground Deliver time frames.